Today I reported what I thought it was a problem on my end but it was actually a bug in the code. Since this may take some time to get fixed and pushed into Android Studio (what I'm actually using) I thought there could be an easy for me to temporarily fix this on my current Android Studio installation. Clone IntelliJ IDEA Community from the GitHub repository. Compile the final binary files. Patching a single .class file inside the jar will probably work, but copying an entire jar will most likely lead to a broken installation. The actual story of synchronizing changes between IntelliJ IDEA and Android Studio is a bit complicated at the moment, and right now there is no good way to fetch a revision of the IntelliJ IDEA codebase corresponding to a particular build of Android Studio. Which is correct. But it won't have my custom rules applied (which there's a bunch, see this image). You may also notice the idea.fix.jar file I've attached. This file is the one that contains the .java/.class file modified by my and it only contains that file in the proper folder structure. 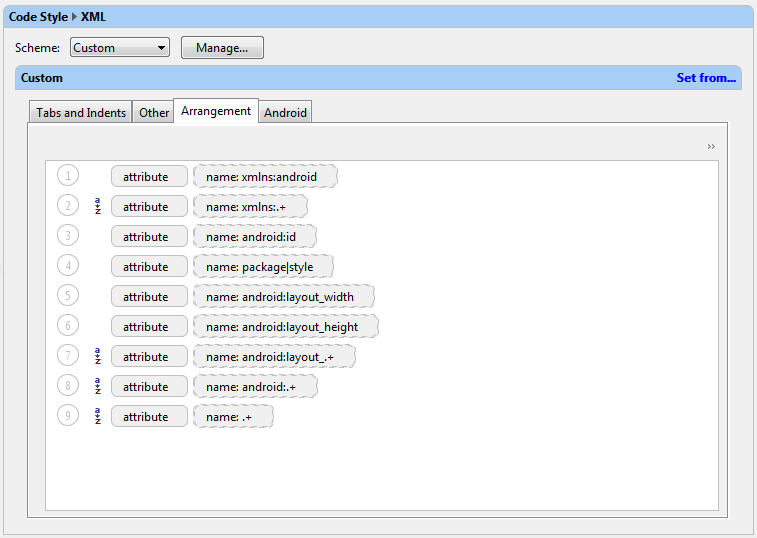 I found this by accident but placing 'idea.fix.jar' on "lib" folder of Android Studio (next to idea.jar) makes it work. Which means I don't need to replace the whole idea.jar file swapping just one .class file inside it. I assume that it works simply because idea.fix.jar is located before idea.jar, that's why when ide classloader is asked to find XmlArrangementVisitor class, it looks into idea.fix.jar first. That was my first thaught, I just wanted to confirm it.